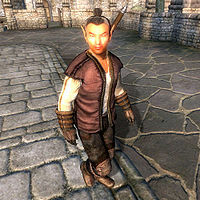 Eridor is a Bosmer warrior who is residing at the Two Sisters Lodge in Skingrad. He and his colleagues Carsten, Shamar and Vontus Idolus have come to town to investigate rumors that Skingrad has been infiltrated by vampires. Eridor is the leader of the hunters, and the one you must approach in order to gain any information about them. He only appears at the start of the Information at a Price quest. He sleeps upstairs in the Lodge from 11pm until 6am and then walks to his assigned guard point in front of the Great Chapel of Julianos. At 1pm he returns to the Lodge to eat lunch until 4pm and then goes back to patrolling until it's time to head to bed again. This behavior changes if the vampire hunters are tipped off about Bloodcrust Cavern. At midnight on the next day, Eridor and the others will head there and attack the inhabitants. He is the only one of the team not to dress in lower-class clothing. Instead, Eridor owns a middle-class outfit of light brown linen trousers, a brown shirt and pigskin shoes. He also wears leather greaves, gauntlets and boots, which he unequips when he's sleeping. His weapon of choice is a steel battle axe, and he carries a small amount of gold. The residents of Skingrad have evidently been worried by the sudden appearance of four vampire hunters in town. The news even made it to Castle Skingrad, where Count Hassildor naturally is very concerned; "There are at least three of them. I know only one by name: a wood elf called Eridor. He's rather good, from what I understand." The first time you meet Eridor he begins a prepared speech: "Oh, no. Not another one. Ahem. Citizen of... Skingrad. Please be advised that I am here on official business, and wish no harm... Oh, forget it. Let me guess: you're worried about what my men and I are doing here in town, right?" If you choose to lie and say you're from town: "You have my assurance that my men and I will do everything in our power to keep the people of... Skingrad safe. We're here to help. If you have seen anything unusual, particularly anything implying the presence of the undead here in town, please report it at once." or rather, if you choose to say you don't live there: "Then what do you want with me? I'm a busy man. I don't have time to stand around and chat." Questioning why they are there will yield several options (depending on if you chose to lie or say you don't live there). If you dig a little deeper, he will admit their true purpose of being in Skingrad: "I am a vampire hunter. I came here with a few others to get rid of the vampires in Skingrad. Oh. That's right. We've heard all about it. Now, we just need to find them..." then asking why they are there "So word hasn't gotten around to all the townspeople. Interesting. They must be very good at keeping a low profile. We heard tell that vampires have infiltrated the town. Came here to root them out." and then asking where they are looking "I've got my men scattered all over town. Shamar's up by the statue, Vontus is out in the High Pasture, and Carsten has the town exit near the Castle covered." Choosing to tell them you have information will yield the following response: "All I care about is where the vampires are hiding. I know they're here somewhere... You know where they're holed up?" Saying No will prompt the response "Then why are you bothering me?" or, if you chose to lie earlier "I see. Well, if you see anything around town, let me know. You could be their next victim." Speaking to him again after the lie will bring the greeting "Hello again, citizen." and speaking to him if you didn't lie will give the greeting "Good to see you again, friend. I don't suppose you've noticed anything out of the ordinary around here?" Telling him that the vampires are in Bloodcrust Cavern intrigues him "Is that so? Well, perhaps we'll have to pay them a little visit. Thanks for the tip, friend." If you kill the vampires before speaking to him and choose the tell him that they're already dead "And what, I'm supposed to take your word for it? Sorry friend, but I'll need some sort of proof. You got any proof?" Choosing no results in "I didn't think so. If you had some sort of evidence, like vampire dust, I might believe you. I'm not stupid, you know." but showing him Vampire Dust from at least one of the Vampires in Bloodcrust forces him to say "Well...maybe you're not lying after all. If they're gone, then there's no point in hanging around here. Damned amateurs. You people should leave it to the professionals." Speaking to him after this will bring the Questions (based on if you lied or not) from earlier but that is all. If the vampire hunters are persuaded to leave town, they actually hang around indefinitely. Eridor will keep following his usual routine. Esta página foi modificada pela última vez à(s) 22h49min de 19 de julho de 2015.